You're all wonderful. I can't say this enough. As BB and B watch odd bits from South Park, I have managed to find every page of my website, beautifully cached, and save them (thanks so much, Zoe and SCB). I heart having a laptop. I can pretend to be doing things with the boys but actually be multi-tasking more than usual. As long as I laugh in the right bits, they think I'm there with them. Super. So now I have the technology, I can rebuild. Bionic website! But first I have to write my next exhibition submission (I'm in a ANCA show about music, coinciding deliberately with the National Folk Festival) and a paper to say at Mackay, as well as finish my upcoming paper for Artlink. Then I can rebuild. I went to back up my website (www.ampersandduck.com*) and clicked the wrong button. And now I've wiped the entire thing. I have a back up of the rotating headers, but that's all. I think I'll go to bed. Or should I stay up all night creating a new website? Not quite a glass of wine on the laptop, but for someone with an urgent 'to do' list as long as my cat's tail, it's a bit of a bad thing. *link added there so you, hopefully only for a short time, can see for yourself. Such is the miracle of on-linery, you have no way of knowing that I am writing this post on my brand new Macbook Pro laptop, the one that is subtly shiny in a way that only brushed aluminium can be, the one that has subtly drained my bank account of all shininess. You'll just have to take my word for it. I have resisted the allure of portable computery (are my new words making your teeth ache?) for many years now, but have decided that it's time to be able to take things between studio and home, to have less of an office presence at home (and therefore the big clean-out), and that it's nice to be able to play on-line scrabble in bed. So aloha to my computer set-up, the most fitting word because apparently it means hello and goodbye; very soon I will be (fruitlessly, I suspect) trying to sell bits of my old set-up on ebay, trying to get something back for the vast amount of money I've spent on it through the years... something, anything. In other exciting news, I just dropped Bumblebee off at school for his Year 7 camp, and the wave of parental excitement at having THREE WEEKDAY DAYS OFF was palpable. I surfed the wave, then I jumped into it, and am now thinking how nice it will be to hang around tonight at the art school for an opening rather than dash home to argue (yet again) about whether the tv can be on during dinner or not. They are headed to the Snowy Mountains for multicultural tasks like dragonboat racing and gladiator challenges. B looked highly excited this morning, wearing my old red giggle hat that he has always coveted (but since he last saw it, it has faded to a charming shade of rose-pink that none of us were game to point out this morning in case he rejected the use of it outright. Luckily none of his mates seemed to care either, calling it a 'cool hat'). I'm still in the process of transferring files and preferences and things, and moving furniture and gasping at deadlines that need to be met, so forgive my probable once-a-weekness for a while. Today at work I have the unenviable task of getting all the workshop's teaching notes on to the new ANU intranet thingy (called WATTLE). And I'll meet all the new students, and catch up with all the returning ones. I do like hanging out at the art school. I've come to the conclusion that the absolutely best song for a quality warm-up session on the cross trainer machine at the gym is Stevie Wonder's Master Blaster (Jammin'). It keeps me at just the right speed, and has the right energy. Early Talking Heads are great for lunging, especially Found a Job, whose lyrics are also a great life motivator. When a friend asks you what you're listening to at the gym, never tell the truth. One day I was caught listening to Hall & Oates' You Make my dreams, which is gym-bouncy and worthy, but social death. I think I've mentioned before that I'm a bit of a stasher; I'm dreadfully disorganised, and tend to keep things in piles, plus I'm an impulsive spender, so if I come across extra cash, I'll stash it. My home office filing system could only be described as a 'deep litter' method, akin to a forest floor, and the last year, since the focus of my work has shifted to my studio, everything has just got deeper and messier. Well. I was meant to teach all last week, but the workshop in question fell through due to lack of many things, from institutional organisation to a quorum of students (I'm going to try again in June and call it a Winter School), so I suddenly found myself with a week up my sleeve. I could have dashed down the coast for some R&R, or I could have spent the week printing and catching up on my commitments, but I decided to pretend I'm moving house and clean a whole lot of stuff up. To make it real, really real, I got out my credit card and hired a 4m skip for a week, thus giving myself a proper deadline and a big space to fill with crap. The skip company delivered the skip exactly where I wanted it: a straight walk from the back door, but behind a large bush so that it was, if not exactly hidden, at least not obvious from the street. I didn't want my neighbourhood to use the skip for me (it's happened before). It was an open skip, as I needed to spend a whack more money if I wanted a lidded one. And then the sky opened up. More rain than we've seen in years. It rained and rained and rained and I tried to peg a tarp over the skip but then it rained and rained and rained, and finally I thought 'f*ck it' and let everything get sodden. One of the appeals of the skip company was that they sift through your discards and send things to various agencies: recycling, tip shop, etc. But it came to a point where I knew that everything I was chucking was just becoming landfill. It rained so hard, at one point I thought the skip was going to be a swimming pool. Oh well. We put on our heavy wet weather jackets and trudged between the house and the skip, the shed and the skip, the garage and the skip. 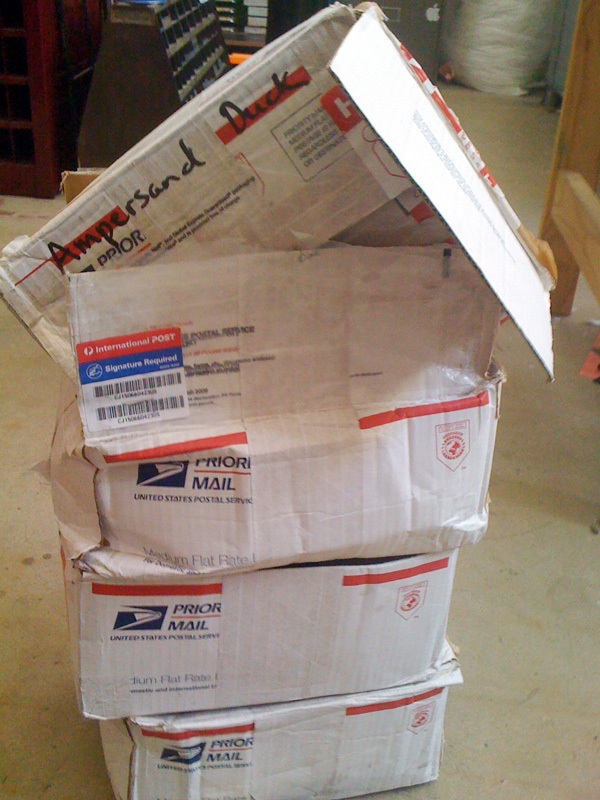 We pulled open a rotting old cupboard in the garage, full of old art materials and textiles and paper stock that had been shredded by a large rodent. Then we pulled the cupboard apart and found the rodent, dessicated and skeletal. And beside it a chewed packet of rat poison that someone, maybe even myself, had thrown behind the cupboard. I guess it worked. I threw out years of drafts of books that will never be republished, from back when I was a desktop publisher. Out went old disks, blurry photos, boxes of uni bricks and folders of notes and bad essays (I kept my favorite essays and articles). Weird plastic containers, etching plates that will never be reprinted (yes, I'd used both sides), bags of smelly things and old toys too brittle to pass on to the children I know. It was brilliant. I found stashes of money so old that I can't remember when I stashed them. Today I bought a dress and had my haircut, using stash money. I discovered that our spare room has a floor. For two nights we had the airbed up, accommodating friends in a space where they had a choice about whether the cats could be with them (the loungeroom doesn't provide an option). Now the floor is messy again, but it's the final push: putting the things that are staying into plastic boxes to store out in the newly spacious shed, and taking the office furniture out to be replaced with a modest desk (for laptop usage -- I'm picking up my Macbook on friday) and a bed for guests. A *real* spare room! Next week uni starts, and this weekend I'll be learning how to marble paper, but sometime after my work schedule settles, I'll be ebaying all the stuff that needs to go: my old computer, the screen, my roller blades (only used twice! ), etc etc. Which may go some way to replenishing my sessional-break-starved bank account. I hope. In other news, Bumblebee is still loving high school, apart from the vaccination he had yesterday when he swears the nurse hit his armbone (he doesn't have much flesh). Next week, CAMP! Fun for him, and a rare free few weekdays for us. No timetable fretting. Bliss! 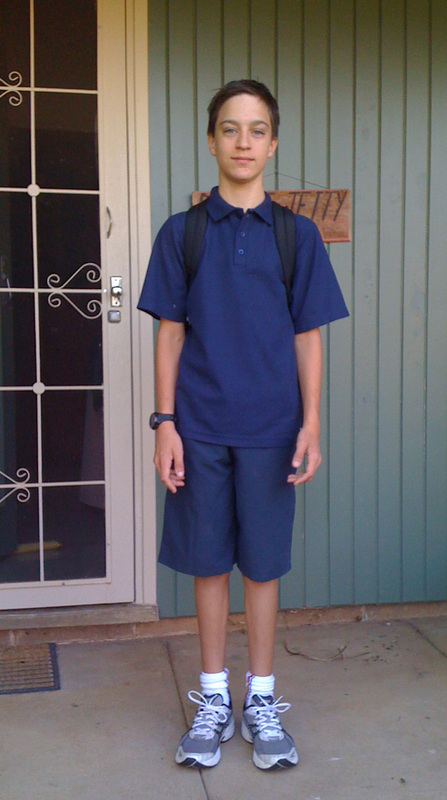 We went to his year 7 class tour last night and met all his teachers. I like his science teacher as much as he does. He's started youth theatre tonight, which should make his happiness complete. Ooh, look at the time. Have to go, time to pick him up. Go on -- what type are you? Find out. I'm Perpetua Titling Light, which is quite nice, really. Yesterday we went to see The Road. I'd been expecting all sorts of faults, mainly because of the reviews I'd read around the traps. Consequently I wasn't expecting it to be as good as the book, and of course it wasn't, because the book is such a readerly experience, the warmth of it transmitting from the inside of The Man's head to the inside of yours, and a film just can't make that connection. I still loved it. The one thing that did disappoint me was the ending. SPOILER -- if you care. It was the way John Hillman centred the ending on the nuclear (ha!) family, including dog(! in a world where animals are gone! I know it was a symbol that these were good decent humans who wouldn't eat their pets let alone other humans, but still...) and not about the natural world that was lost, which is how the book ended. Always human human human human preoccupations. Last summer Sophie Cunningham and I had an excellent conversation in the fresh air of the Melbourne Botanic Gardens about reading whilst travelling and how it influences your travels. We thought a series of short writings on the subject would be wonderful. She had a post she’d prepared earlier, but it’s taken me this long to cook something up. When I travel I choose books to read without much thought to the impact they may have on the travelling. Maybe they have been saved for holiday reading because of their lightness of being, perhaps they are next on the bedside pile, sometimes they are bought along the way when there is nothing else to do. I didn’t mean to take Cormac McCarthy’s The Road with me to Tasmania; I’d already read it, a year before, and had lent it to my sister-in-law. She returned it just before we left and I hadn’t removed it from my daypack. Reading on holiday is part of the holiday, and I read things that I feel like reading rather than things I should be reading. According to my reading ledger (a Moleskine notebook listing everything I’ve read since July 2000 when I got tired of keeping a diary and decided to record only the things I wanted to remember), I was reading the Philip Pullman trilogy on the boat across the Tasman and the days after our arrival, enjoying the differences between Northern Lights and The Golden Compass. Pure escapism mixed with daily dreaminess: the perfect holiday. We -- my husband, my ten-year-old son and I -- started in northwest Tasmania, visiting tucked-away Tasmazia in all its faded glory in the depths of Brethren territory and then passed through numerous hamlets desperate to stay alive by cultivating affectations like thickets of topiary or blankets of mural. All of which, in retrospect (I think my favourite way of travelling) suited Pullman’s visions of multiple worlds. We moved slowly southwest: Cradle Mountain, Zeehan, Strahan, up the Gordon River, picnicking on the Franklin, all the cartime listening to an audiobook – abridged, unfortunately – of His Natural Life, attempting to give the boy a feel for where we were. He was impressed, but unfortunately it also served to show us exactly how little Marcus Clarke knew the territory about which he was writing. It was about this time, heading back to the east and Hobart, that I decided to re-read The Road. I re-read books constantly, usually after a gap of at least a year or more. I’m also extremely fond of dystopian writing, with particular fascination (Gen X that I am) for post-apocalyptic survival stories, although not so much the type that makes mankind revert to sword-and-shield pseudo-Celtic tribal structures. 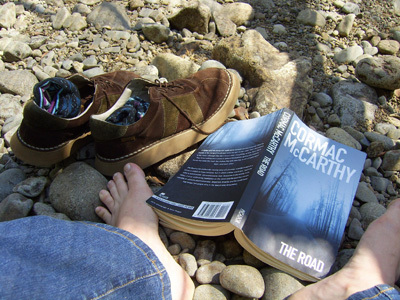 The first time I’d read The Road (Jan 2007, says the ledger) I remember reeling from the impact, unable to read anything else for a short time, coming down slowly from the sense of heightened insecurity any good post-apocalyptic book will inject a reader with. I was curious to see if, now that I knew what I was in for, the same thing would happen again. To this point, Tasmania had been wild and magical and lush; the south-west has the potential to be threatening and dour, but had provided enough jollies to keep my imagination at bay. Tourists, including us, have permeated the toughness and softened the inhabitants who have come to know who butters their bread. I began the book during a quick picnic on the shore of the Franklin River, upstream, under a highway bridge, sitting on a boulder, half-listening to my husband talking about the part his brother played in the protests, the boy listening fascinated. Within the first few pages I’d stopped listening altogether, and was totally submerged in a wasted world. When I emerged to keep driving, all I could think about was how lucky I was to be among living things, all those trees, all that living water, all that protest. It made a lake. Before they built the dam that was just a river down there. The dam used the water that ran through it to turn big fans called turbines that would generate electricity. Can we go down and see it? I think it’s too far. Will the dam be there for a long time? I think so. It’s made out of concrete. It will probably be there for hundreds of years. Thousands, even. Do you think there could be fish in the lake? I initially read the book slowly, allowing myself to be distracted by the charms of Hobart and Port Arthur, putting the book aside in favour of television, local newspapers and trashy magazines. Five days later, we caught a very rough ferry over to Maria Island off the east coast, taking only what we could cart in a human-drawn wire wagon over the car-free roads of the National Park island. The machine-free silence of the animal-filled camping ground was perfect for losing myself again in the animal-free surrounds of The Road. Twilight seemed long on the island, and it was a fair walk to the toilets. I’d never seen so many marsupials in one spot, and was afraid that if I squatted in the bushes surrounding the tent I’d get any kind of nasty surprise. Wandering back past the convict ruins, looking up at the pristine sky with more stars than human thoughts, looking around at the strange vegetation, looking down at the tent, I could have been living at any point of time. When I returned, looking into the tent at my son sleeping with his limbs splayed on his airbed was exquisite. After Maria Island (not to be done in a day; we will be back for a longer stay), we went north up the coast to Coles Bay, a place I’d been years before on the honeymoon of a marriage that didn’t last. We were lucky enough to get a gorgeous camping spot in an area that is highly sought after and distributed by ballot: getting a last minute cancellation like we did is like winning the lottery. Clean, well-maintained individual spots with personal tracks to the beach and a view over the bay to the mountains called The Hazards. 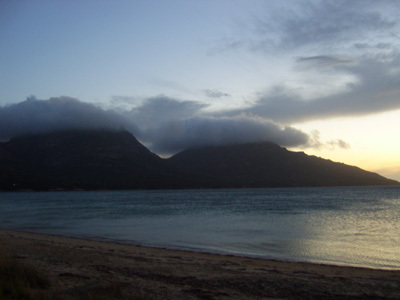 Sitting on the beach with a torch, the book and the ominous clouds that settle over The Hazards every night without fail, no matter how blue-skied the day has been, I finished The Road on that first night at Coles Bay. Afterwards I put down the book, turned off the torch, and sobbed, watching the lights of the town twinkle to my right and listening to the other campers go about their evening drinking. Next morning, before the others woke, I re-read the ending and other parts that had stuck with me, and sobbed again, silently into my pillow. I watched them wake. 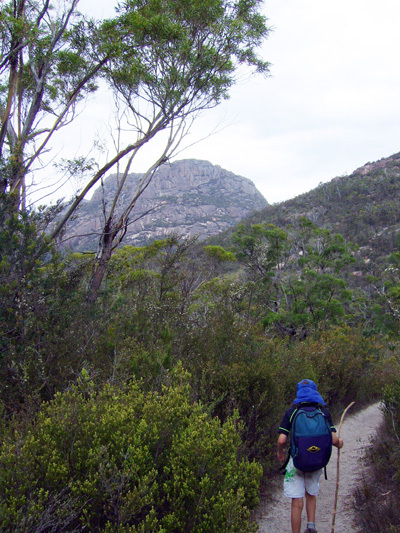 We all went for a bushwalk up The Hazards to Wineglass Bay and back, a full day of walking. I had done part of this walk before, and I may yet do the whole thing again, but I guarantee you, I will never be able do it again with such a heightened sense of emotion. My husband is fit and strong and likes to walk fast. Normally patient, he becomes exasperated when thwarted in expending his excess energy. The first part of the walk was fraught with tensions as young man loped, older man barked, and I dreamed along in the rear, taking in every leaf, every bird, the shift in blues between the sky and the sea, the occasional lizard or marsupial. Once we’d reached what we thought was the halfway point and had a swim, I encouraged older he to leave us behind, to go at his own pace, and meet us back at the car where he could probably read most of the paper – and do the crossword – by the time we made it. 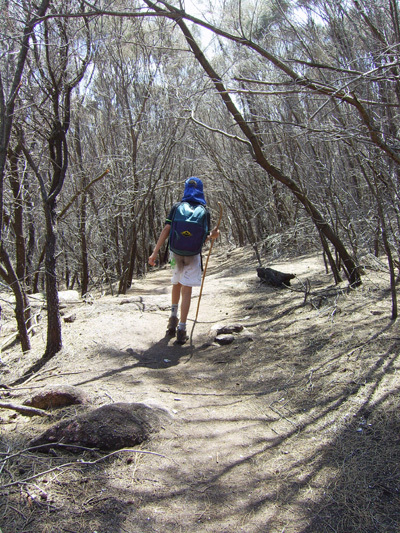 Once he’d disappeared around a bend, the tension lifted, and my son and I closed ranks and walked at our own pace. For the first six years of his life I was a single parent, and twice in that time he was close to death. Standing over his hospital bed I forced myself to envisage a life without him: bleak, but do-able. Ever since, he has been the most precious gift in my life with every day that he exists. He doesn’t remember much of that time, and he loves his stepfather intensely (as do I), but when we are alone there is an heart-muscle memory of such intensity that we invisibly clutch at each other. We walked. He whistled. I laughed at the dark patch of sand-stain on his white swimming shorts. We entered a part of the landscape full of dead fire-blackened trees and grey dust, bleak and twisty. My imagination went into overdrive. I watched his tall, thin, fragile frame walk in front of me in the grey dust, the trees obscuring any part of the real world, and thought about a short story I’d once read in the New Yorker: a woman living in an apartment block thinking about how she would manage in a post-apocalyptic New York, whether she would have the guts to fight the woman in the next apartment for water, whether she would be resourceful enough to find what they needed in the streets around them. Written before 9/11, the story has haunted me with its questions about personal resilience and I wished I had kept a copy. I took out my camera and took a photo. 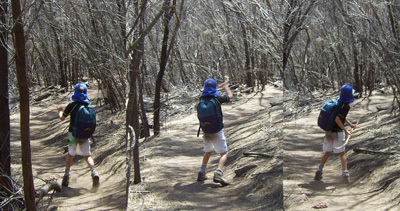 Before I could put the camera away from taking the above shot, my son suddenly began a series of what I think of as his ‘battle moves’: pretending he’s fighting some invisible enemy and winning. They usually make me laugh, because he’s such a chicken in real life, hates the sight of blood, animal guts, won’t clean up messes because they’re messy. This time they touched me; he is so vulnerable, so open, so precious. What would happen if I wasn’t there? And then we emerged from the dead wood into sunshine, pink rock, butterflies and sea sparkle. He would cope. He has his fathers. And he has this beautiful world. For now. I can hear a river, running hard behind me. There are urgent voices discussing something in a language I can't understand. I seem to have a fur hat on. The river is loud, and getting louder. The voices just don't stop. My hat is hot. I put my hand up to adjust it, maybe take it off, and it uncurls and stomps on my face. I wake. The cat jumps off the bed. It's dark, but the sound of the river persists. I'm not sure if it's really heavy rain, the sort that I'd driven through very slowly the day before, or if it's actually a river. But I'm at home, of course it couldn't be a river. The voices are still urgent, and I still can't understand them. I sit up in bed and look out the window at the street. I can hear the water, but until I reach for my glasses, I can't quite make out what is happening. Has the street flooded again? Sort of. 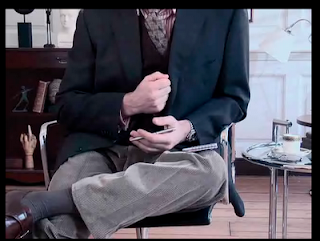 Once I got up, and staggered down to the other end of the house, I pieced together the weird scraps of information. 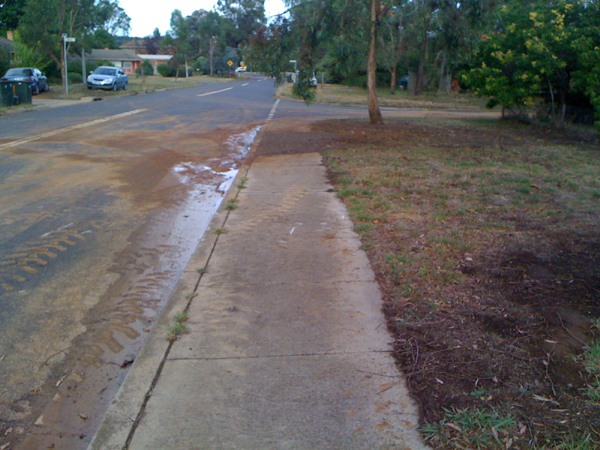 The water main on one side of the corner on which our house sits had exploded, or at least burst, and was gushing enormous quantities of water out onto the road, which was then rushing past our window into the nearest stormwater drain. Our verge is awash, muddy water swashing all over the road. Some Asian neighbours, out for a midnight stroll, as they often do (thankfully! ), have rung ACTEW, the local water people, and are standing on our corner, watching the amazingly shameful waste of water and chatting urgently to each other. It is about 1:30am. Best Beloved, always aware of our culinary needs, checks our tap water and finds it sluggish, so fills a number of plastic bottles in case we're cut off for a long time. I could never have thought of that; I'm sitting in my undies & singlet, watching through the loungeroom window in the dark, fascinated by the sound of the water. 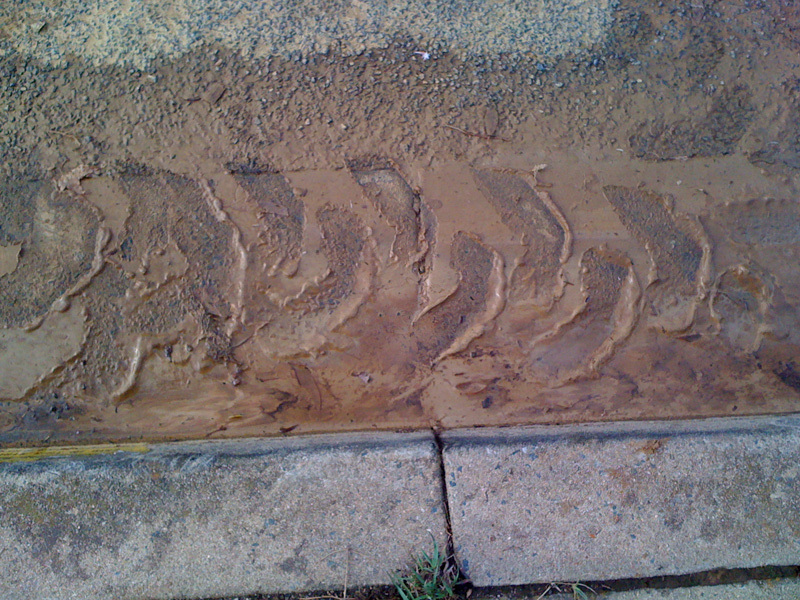 Suddenly a couple of monster trucks roar up and mount the kerb and our driveway. Flashing lights, beeping noises, men huddled in groups: everything activates and gains urgency. BB dons a dressing gown and goes out to see if there's anything we have to do. We're told to go back to sleep if we can, but there'll be a bit of noise throughout the night, and they start ripping up the footpath near the gushing. We do our best to sleep, despite the truck noises, the water rumble and the seemingly persistent voices of our neighbours, who seem to want to stay and witness the event all night. The next morning I am woken by the sound of the truck driving off; the silence is deafening. I go outside, and all I can see is mud, and tire-tracks. It wasn't a dream. The gum tree on our corner has had the watering of its life, and will probably double in size this year! To my surprise, I'm managing to get to the gym twice a week, but it's still early days yet because uni hasn't gone back. I'm hoping not only to maintain a biweekly visit, but add some sort of class to get my aerobic fitness up. I'm happy with my progress so far; I realize that I'm never going to be willowy slim, and my upper arms are never going to whittle down from their slab-like peasant appearance so they might as well be firmer, and I can see the improvement already. Plus my neck and back are feeling stronger, which is very important for my pain management, especially if I want to keep using heavy drawers of type in my art practice. The thing that keeps me amused at the gym -- a very important component to keep me going -- is watching all the 'gym faces': the wild grimaces that people make as they lift something heavy. I can't decide if they're doing it to be seen (many strut around to make sure you can see them before they start) or they think that no-one is watching. Either way, it's hell-a-fun, to quote Cartman. I'm really proud of Bumblebee, he weathered the first week of high school very well, coping with the complete paradigm shift like a trooper. He's got a teacher he adores (o wot joy, it's a science teacher! ), a teacher he can't stand, which is always a great foil and takes the heat off the other teachers; he loves the fact that they have a dedicated year 7 quadrangle, and he finds the varied classrooms and period times makes it easier to focus his mind on the relevant classes. Yee-haw! This is going to be fun. BB took advantage of our first child-free weekend today and saw Precious, which was quite an intense experience. BB always gets excited about cats in movies -- we have a family rule that a movie is extra-good if there's a cat in it -- and got grumpy with me when I told him that I thought the cats were there as a metaphor for the selfishness of Precious' mother and to highlight the fact that she could care for cats more than her own flesh and blood. "But they were such lovely cats," was all he could say. I'm a bit sad that he didn't come to see Bright Star with Bernice and I, because it has a wonderful cat called Topper who almost steals the show. OK, let's try that again, with more words. 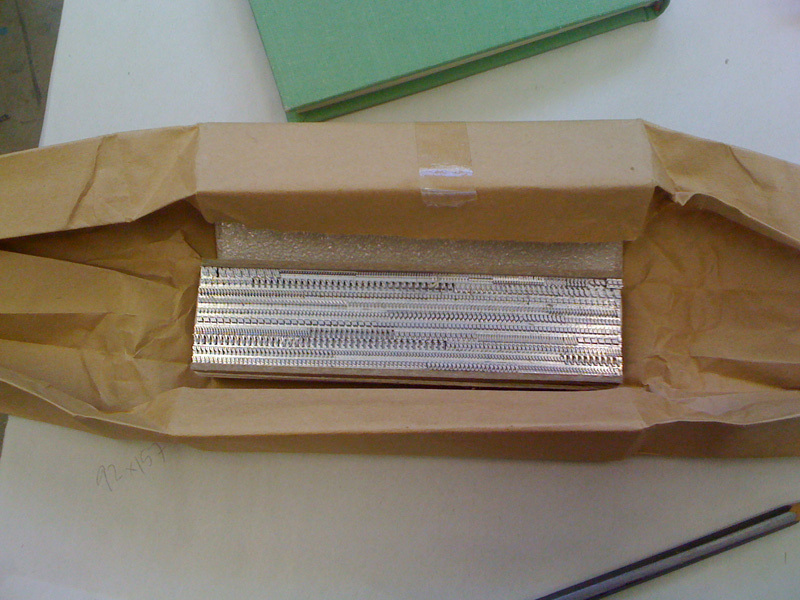 A few months ago I ordered some fresh type from America! From San Francisco, to be precise. Via Monash University, who also needed some, so we thought we'd pool our resources a bit & share freight. 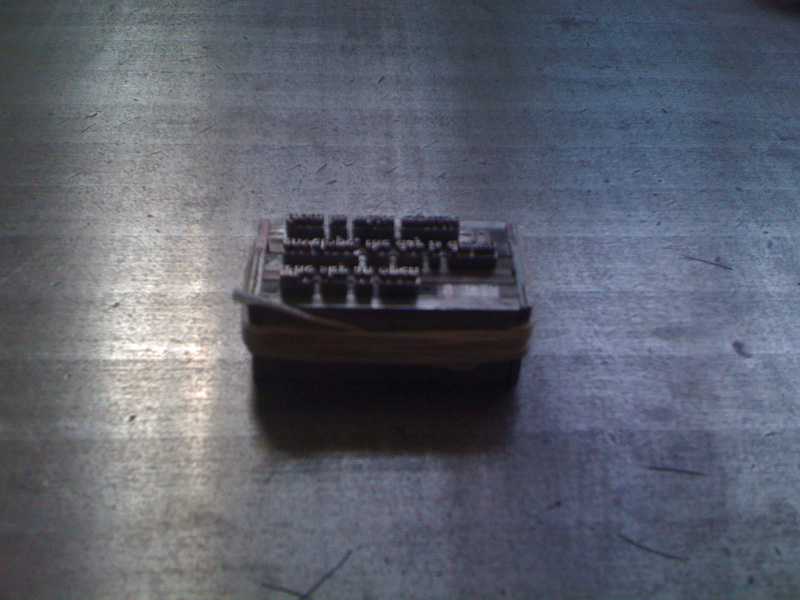 It didn't work out to be any more efficient, but it was a nice thought at the time. The type ended up in Melbourne, and then was generously couriered up to Canberra by my colleague's daughter, who was visiting Canberra to sing at a meeting of uni choirs (and the sound coming from her rehearsal when I met up with her was DIVINE). Closer up, you can see their labels a bit better. 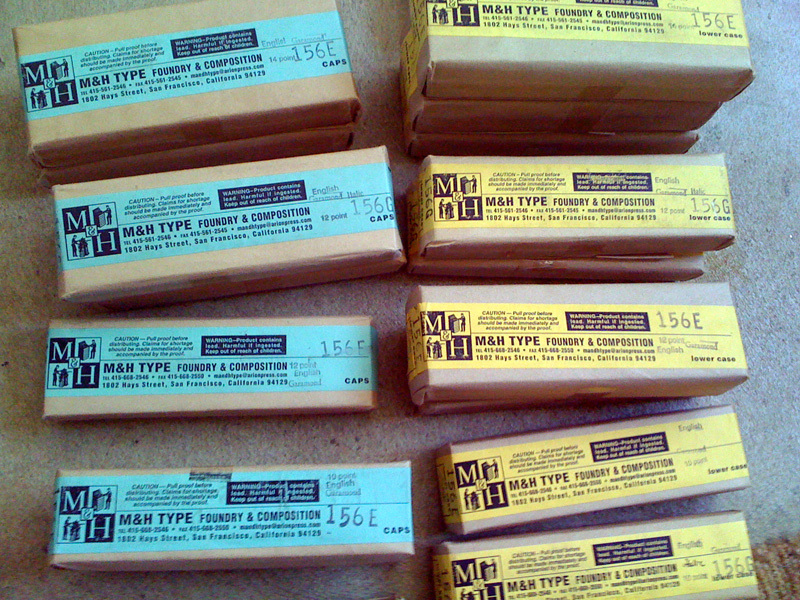 I bought a heap of Garamond English, and a few packets of Gill Sans to supplement the sizes I already have. They are my 'house' fonts. For now (read on, Macduff). And when you open them: AAAAHHHH! Shiny! New! Freshly-cast! Clean! TYPE!!!!! This is the equivalent of seeing Van Gogh only in badly-printed reproductions all your life and then standing in front of an original VG painting (an epiphany I had in the early 1990s, and common to many Australians who went 'back home' to Europe). The difference is stunning. Each packet has beautifully packed letters; the yellow packets are lower-case with some punctuation, and the green packets are upper-case and numerals and some punctuation (one makes you smaller, one makes you larger :) ). So I got to work. 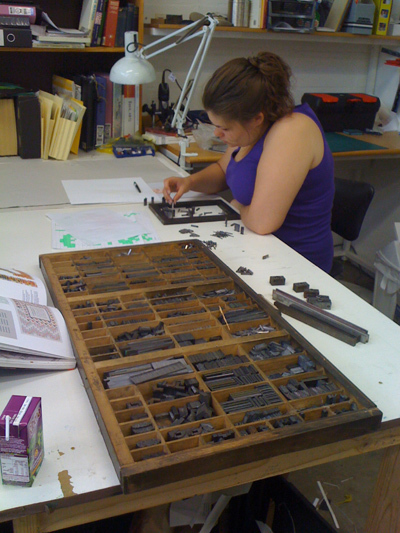 I've had a book commission waiting for the new type, so I wasted no time setting some blocks of lovely 10pt Garamond. Fresh type doesn't make your fingers dirty! Unfortunately the dirty old spacing does, so I still had grot on my hands by the end of it. The hardest part of fresh type is putting the ink on it, because you know that you'll never see it so clean and shiny ever again. Still, I steeled myself and rolled it up. Lovely, crisp print. Sigh. Here's my desk, covered in workings. It's a book of poems by Sarah Rice, a colleague at the school of art, with images by Patsy Payne. 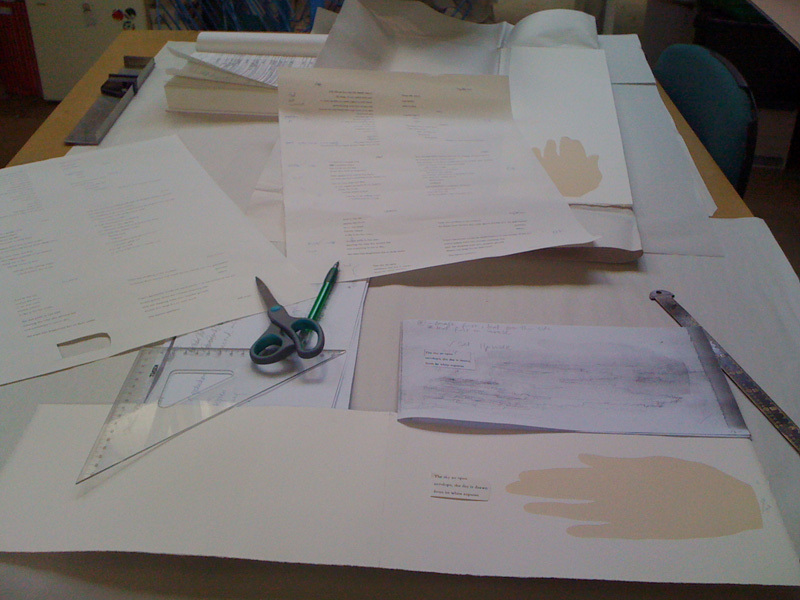 The hands you can see were printed using lithography, and after the text is printed, they'll have graphite drawings pounced on top of them. It's going to be exquisite. 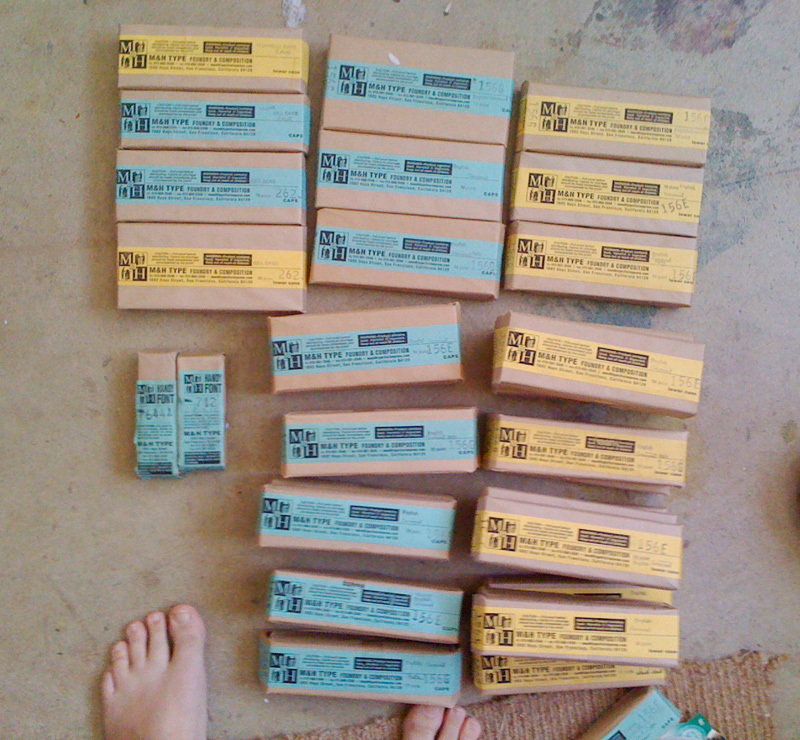 The string from the parcels gets used again; each piece will have a long, fruitful working life as it ties up blocks of type waiting to be printed. 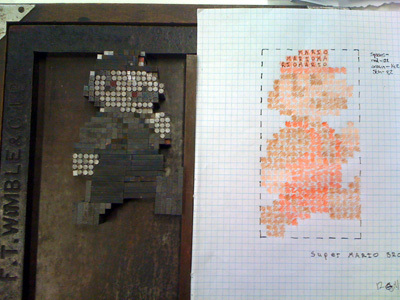 The tying up of blocks with string is a very important letterpress skill, and not to be underestimated. You don't just wrap and tie a knot, there is a special technique to be learned (and passed on!) that involves no knots and the ability to pull the string off again easily. This is me comparing the type proof with the original computer mock-up. Same font, same size, but much nicer printed with type. You can see the mocked-up graphite pouncing in this shot. Since last week I've printed half the book, and will spend today setting and proofing the other half. I love uni holidays, they're so long, and I can get so much backlog cleared. 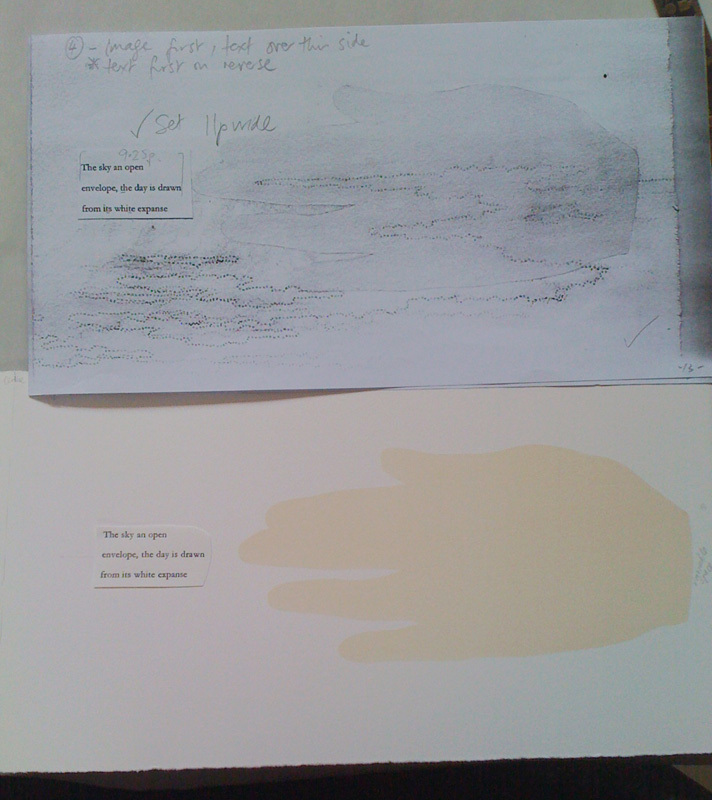 I've finished printing the Garth Nix short story ('Endings') as well (now my collaborator has to make the images and then we can collate the little book we're making) and next is my Book Art Object attempt. Must get back to it! OOH! 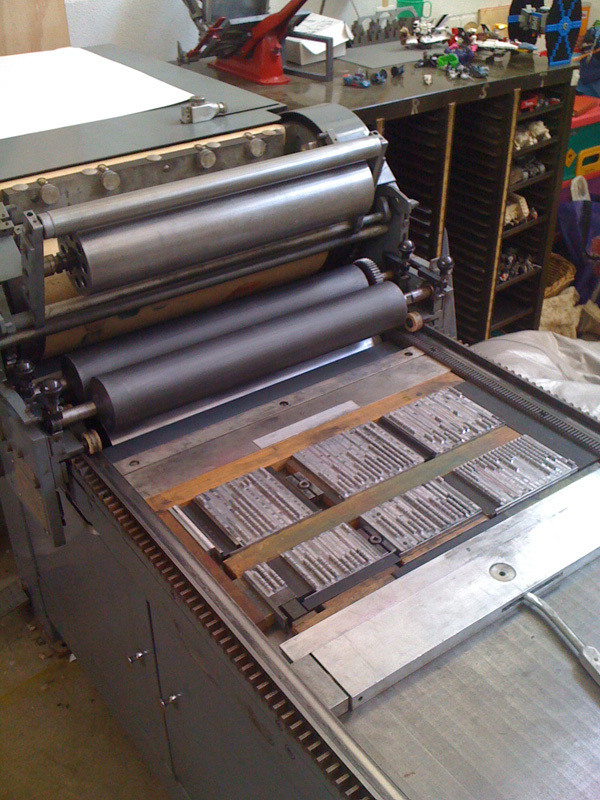 Forgot to mention (although you can't really tell that I've left and returned, such is the magic of blogs) that I've now been offered an entire collection of type, for a very decent price, which I will be carting into my studio by the end of the month. This means that (apart from constantly scouting for wood type) I officially have enough type. What a concept! It also means I have to move on some of the dud type I already have. My house fonts will be Garamond, Gill Sans and Baskerville. So happy. SO HAPPY. Oh, I feel the urge to go and get my hands dirty, right now. Bye. PS: Bumblebee is loving high school: PHEW. I'll come back to that.